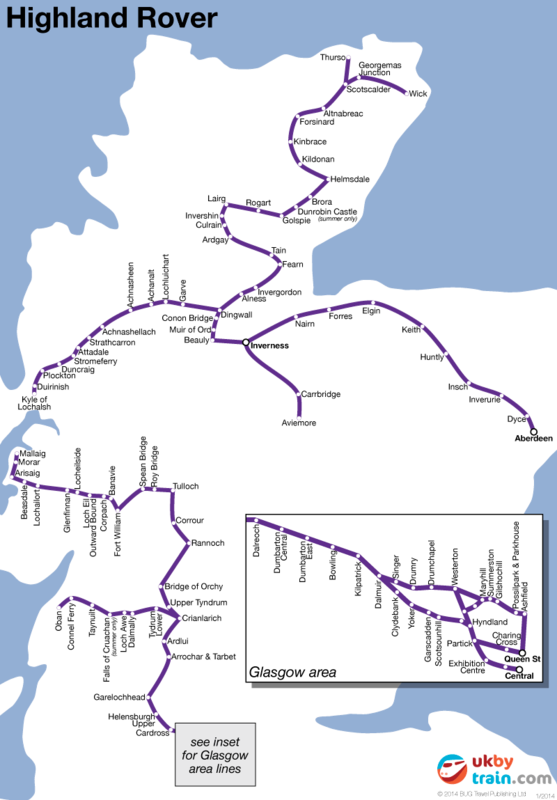 The Highland Rover rail pass is good for unlimited travel on most train services in the Scottish Highlands and it also includes travel between Glasgow and Oban, Fort William and Mallaig plus bus and coach travel in the Highlands including on the Isle of Mull and the Isle of Skye. Ferry travel is also included to the Isle of Mull and Isle of Skye with Caledonian MacBrayne. You can buy the Highland Rover railpass outside the UK with delivery to Australia, Canada, New Zealand and the United States. Click below for details about international prices and international delivery. The Highland Rover is valid on the following Caledonian MacBrayne ferry services: Oban–Mull and Mallaig–Skye. The Highland Rover is also valid on Scottish Citylink/West Coast Motors coach services from Oban and Fort William to Inverness and on the Thurso–Scrabster coach service operated by Stagecoach in the Highlands. Highland Rover pass holders are eligible for a 10% discount on single and day return fares on D&E Coaches services between Inverness and Durness.